Whether you work for a large publication or are self-employed, it may be challenging to balance all your professional and personal obligations, especially during the holidays. Learning how to “shut off” and appreciate what’s in front of you may seem easy, but doesn’t often happen. But it’s necessary if you want to avoid burn-out. During last week’s ProfNet #ConnectChat, lifestyle writer, style columnist and author Rachel Weingarten (@rachelcw) discussed how to balance the demands of work and the holidays. Read on for some of the tips and tools this professional multi-tasker can’t live without. You may even learn how to truly be ‘out of office’ during the holidays. How can we avoid holiday frazzle and really enjoy the season? It’s hard not to get frazzled during this time of year. For some, it’s about remembering the deeper meaning behind the winter holidays. For others, it’s about reconnecting with the people you love. For still others, it’s cutting through the crush to buy everything in sight and instead concentrate on what’s meaningful to yourself or those you love. So perhaps the best thing to do is treat the holidays like any puzzle or even work project. Come up with a plan — how much time you’ll devote to shopping, how much you will or won’t spend, how much time you’ll spend with relatives, and how to respond (or not at all) to those well-meaning relatives who seem determined to cut you down to size. There’s so much about life that isn’t manageable, perhaps the key is to learning to manage expectations during the holidays. The holidays are a wonderful excuse to distill your feelings and emotions down to what matters most. Sometimes that gets lost in the retail shuffle and the old bad feelings can emerge. Try to focus on the simple things — hot chocolate on a cold morning and a gift that really means something. It doesn’t have to be life changing to matter. What about at work? Is it possible to balance holiday cheer with professional obligations? Probably not. Okay, I’ll amend that — probably not entirely. I used to create/lead a lot of professional etiquette workshops and one of the things we discussed was that whole personality clash/balance thing. It can be hard to get through incredible work pressures while trying to plan holiday fun. Conversely, it can feel impossible to get through a holiday meal or get together without checking email or texts 34 times. I think setting boundaries for yourself can be the most important thing to do on both counts. Don’t forget to work when you’re being paid to do just that, but don’t forget to enjoy the not so simple pleasures of family and friends during holiday time. What role has technology played in finding a work/life balance? Has it made it better or worse? Instinctively of course, I’d say worse. But that’s what people thought when the light bulb and telephone and radio and TV were invented. But I do worry that people are so busy staring at screens and comparing their highlight reels to everyone else’s. People seem to miss out on life’s smaller moments and eye contact seems to be a dying art. That said, our hyper-connected lifestyle doesn’t seem to be going anywhere, so it’s time for us to figure out how to make that help us in the long run. Setting up apps for everything from making your greeting card lists to gift buying to travel to setting up autoresponders or putting your phone on sleep mode during family time can help reclaim some balance. What about freelancers? How can they better manage their time, most especially during the holiday and end-of-year crush? Being self-employed, this is something that I struggle with on a daily basis. It’s hard to shut off at the best of times, much less when you’re the proverbial chief cook and bottle washer. For me at least, it’s setting guidelines — no email responses after x o’clock; taking a weekly tech Sabbath. Maybe start by informing your clients that you’ll be out of the office in advance and try to finish up projects or at the very least inform clients or colleagues of when you’ll be back and ready to finish things up. The flip side is that as an obsessive freelancer, I also usually pick up a ton of business during the holidays. It’s a fun way to take advantage of the corporate culture that shuts down for much of December. But that’s my personal choice — and I get to charge a lot more for those gigs! How important is it to delegate responsibilities when it comes to achieving work/life balance? Crucial. But it’s as important to know which responsibilities can be delegated and also when to let go of perfectionism. It’s also a lot easier said than done. The pursuit of perfection is an impossible ideal. Understanding how to be great while still having a life is, in my opinion, the more achievable and attractive ideal. Learning to delegate is probably your best tool in doing just that. Why do you think it’s challenging for people to find a way to balance their professional with their personal obligations? For all of the above reasons and then social media magnifies the achievements of others. If it wasn’t already hard enough to keep up with the people you went to high school with, your neighbors and coworkers, now you’re reminded of everyone else’s accomplishments on a daily basis. 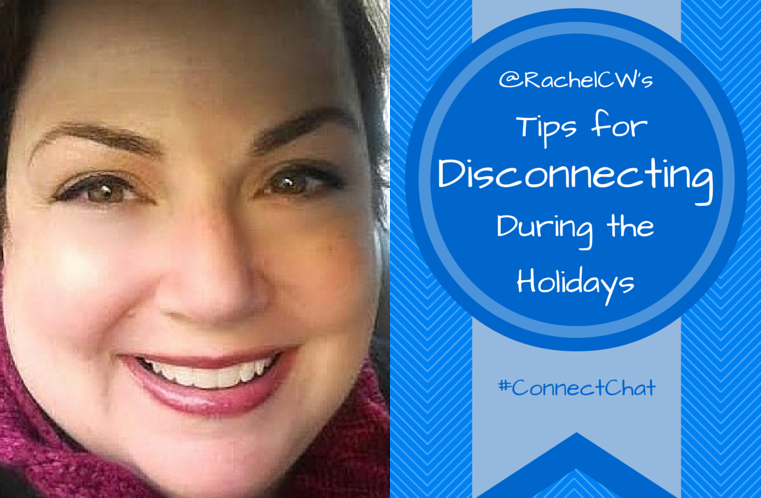 What are your best tips for disconnecting just enough but not too much over the holidays? I think that’s the key. Figuring out what’s just enough. I don’t think it’s realistic any more to think you can disconnect entirely during any point, even the holidays. Maybe set up a twice-a-day check-in. Then, schedule responses and calls and texts and stick to it. It’s a huge relief not to be chained to your obligations. And maybe that’s a takeaway for year round, so that you no longer allow yourself to wake up at 3:30 a.m. panicked that you forgot a work thing or neglected your kid. I’m a huge fan of things like Boomerang for Gmail, so you can at least seem to not always be available. Do you have any tips or advice for people on the pressure to change at the beginning of the year? Don’t do it! My first instinct is to tell you to stop being so hard on yourself. You’ve developed into the person you are by understanding your best qualities. Of course we all feel so much pressure to change and to want to become better, so I say take baby steps. Start with one small thing and build from there. Don’t change everything, just the parts that are no longer working for you. Need sources and experts for that story you’re working on right now? ProfNet has thousands of folks available to help. Submit a query, search more than 60,000 profiles on ProfNet Connect, or get timely experts and story ideas by email — all for free! Register at PR Newswire for Journalists and submit your query on the ProfNet tab or email profnet@profnet.com if you’d like help getting started. For more of Weingarten’s holiday tips, read the full #ConnectChat recap on ProfNet Connect. Polina Opelbaum is a community services specialist with ProfNet. To read more from Polina, check out her blog on ProfNet Connect.